The boys are getting used to their toddler bed, and the expectation to stay in their bed. Yay! The last (almost 2 years) has been wonderful, amazing, sleep depriving, and a huge learning experience. But I feel like we are really entering a new phase. Where we always have to be on our toes mentally, not just physically. The boys are getting so smart, even while their spoken language remains relatively small, I am fairly sure they understand the majority of what we say. And they test their limits constantly. We made the switch to toddler beds last week. WOW. The first nap time and bed time went great, but then they really started to test us! The second nap time I spend 1.5 hours putting them back in bed before tossing them into this enclosed portable crib we have (where they went to sleep immediately.) I was ready to give up, and for a few days if they didn't stay in their bed I would put them in the portable crib. 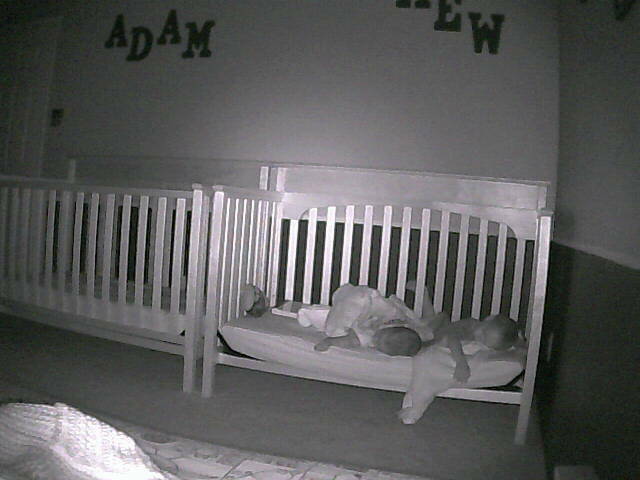 Then I tried the crib again, but they have become quite the little acrobats. So we knew it was time to really transition to a bed, and so we tried the toddler beds for a second time. On our second try, the first nap and bed times went really smoothly again. That infamous second nap time was today, and again I spent about an hour putting them back in bed (and disciplined them each time). But this time I was determined to make it work, and eventually they stopped climbing out and went to sleep. WHEW. Today at bed time they didn't get out of bed ONCE. (But we did have to go in once for climbing). (And may I just say, "yay! for video monitors). I am hoping the worst is over, but if it's not... I have said lots of prayers for patience!! They are sharing one toddler bed. I have tried to switch it around so they can sleep on a bigger mattress, but it seems like every time I change their arrangement, it sets them back. So for now this is how they sleep! *The boys just completed their first week of a two week swim class. Adam loves to jump in the water into our arms over and over. Matthew loves to "scoop" with his hands and kick with his feet as fast as he can! Adam very slowly and deliberately "scoops" and kicks. It is very funny and cute to watch them side by side. They both are hesitant about blowing bubbles underwater (although they will do it in the bathtub) and about putting their ears under the water. The boys wearing a few of Alan's old outfits.